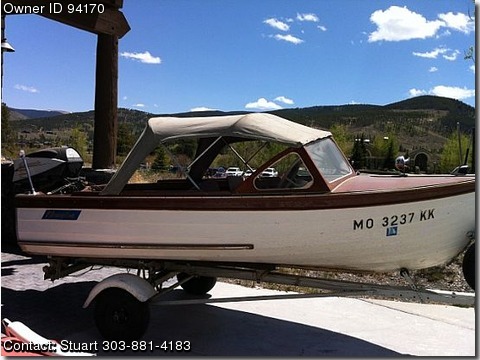 Call Boat Owner Stuart 303-881-4183. Electric Start. 1961 Thompson 14 foot lapstrake construction. 1961 Evinrude "Lark Deluxe model" 40hp outboard. "Spaceship" design on shell. 1958 Mastercraft trailer. Clear title with manufacture's ID number. My grandfather was 2nd owner, and has always been stored in garage. Wood needs minor work, but overall good condition. Bemini top has few tears, but repairable.